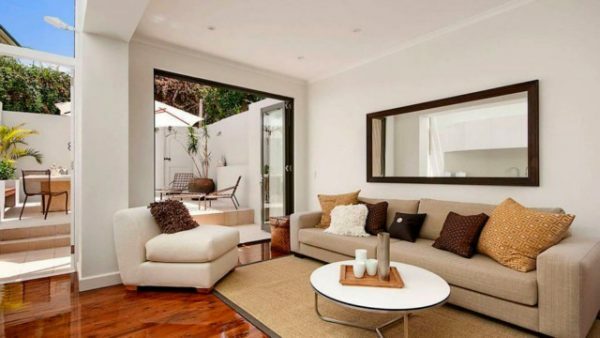 The decorated living rooms are the dream of many people, who want to have their own home. And when it comes to decorated living rooms, there are thousands of styles and designs of decorations available. Currently in the market today for making living room decor, it does not take much effort. Just good old research, and you find several styles of living room decorations available. Room decor encompasses combinations of shapes, colors and textures that blend together to create a comfortable, friendly space where we feel relaxed, cheerful and inspired. Here are some ideas for decorating modern, rustic, comfortable living rooms and more. 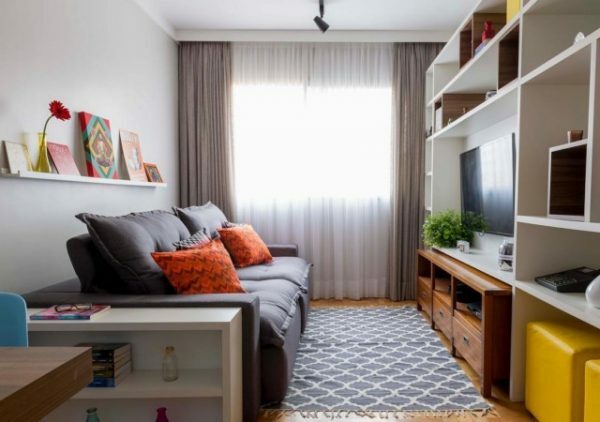 In 2020 there will be an explosion of vibrant and warm colors, so one thing is certain: the decorated living rooms will no longer be boring and monotonous places. The color will stay in chairs, armchairs, sofas and accessories, as well as tables and lamps. And classic modern models, whether Cassina, Ligne Roset or Thonet, return to be protagonists, thanks to the updated colors, which become one of the most striking trends of this year. The only furniture in a distinctive color may be enough to revitalize the entire aesthetics of the Decorated living rooms. 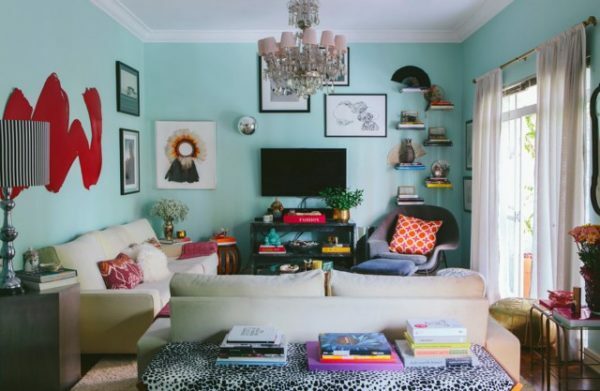 Also noteworthy is the strong and playful presence of pastel colors. We can see sunny yellow or lemon yellow, red-orange or green in all its varieties. Another intriguing and deep trend is a combination of green pine, mustard, royal blue or red bordeaux, which form a style of decorated living rooms. And speaking of baroque influence and the richness of textures, we must direct our attention to the use of rich materials such as velvet, different shiny metal surfaces and the addition of dark wood. 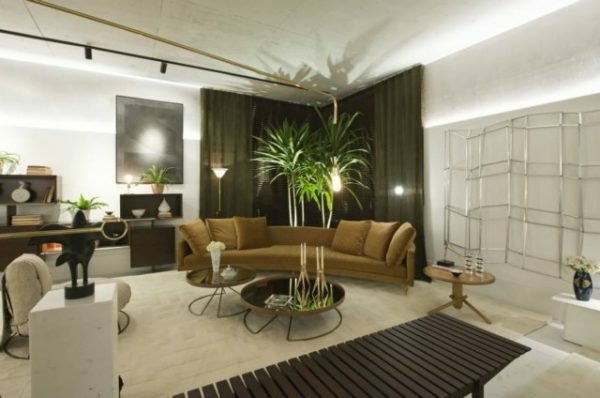 Satin gold or brushed brass can also contribute to this type of living room decor. While the use of bronze has been prominent in recent years, now we are seeing more shades of gold and bronze. This places a strong emphasis on the splendor of the interior in our home, especially in the living room decor. The combination of modern Scandinavian style and vintage charm. 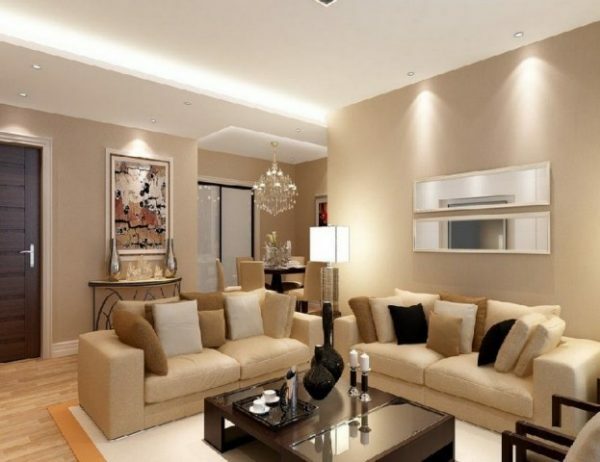 When combined with a hint of gold it can give a sense of luxury and nobility in their decorated living rooms. Inspiration on vintage furniture pieces can be seen in almost every collection of the most renowned brands. The use of new materials, new technologies and aesthetics are inspired by designs that remain in time. This makes the design of the living rooms decorated more rich and fun. However, this purpose and the reincarnation of the design of the antique furniture show their contemporary uniqueness: the sofas expand and stretch, the seats are large and cute. Inviting comfort and leisure, the new trend in armchairs indicates they are large, swollen and soft as an expression of modern life, where people return home after a busy day and want to rest and feel comfortable. The ambiance should be luxurious and elegant. Regarding the shelves of the decorated living rooms, you can cover an entire wall, without losing functionalism and style. In this case, the shelf installation can also be moveable, and can also serve as a living room separator. There are very versatile modular systems, which in a minimalist language can accommodate all parts easily. The coffee tables in decorated living rooms are dressers, but also offer a world of originality and versatility. Marble, wood and metal, geometric and linear prints, with unexpected rounded curves, can contribute with their grain of sand to form living rooms spectacular decorations. For a pleasant life and a vital interior composition we need contrast and dynamism. If the walls are monochromatic and colorless, you can add vitality using shades of yellow, green, pink or blue. All the small details and not so small in the rest of the composition of the decorated living rooms. Like objects of art, wallpaper, ceramics or lamps, they are made up of fashionable materials: steel, marble or wood, shiny brass or satin gold. How to combine them and create a fancy mix? Take a look at some of these examples. 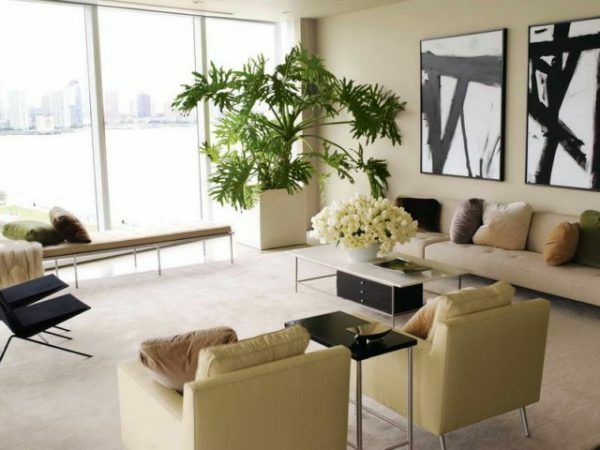 The living rooms decorated are characterized by simplicity and minimalism. The furniture has clean lines and there are no unnecessary details or decorations. The inspiration for living room decor is based on practicality, functionality and space-saving ability. Creating a well-ventilated and spacious decor. The color palette is usually based on soft, warm colors like beige and brown. In the decoration of living room can introduce the color through some accent pieces. They can take the form of furniture or decorative elements such as cushions or rugs. Another very important element in the decorated living rooms are the modular furniture. 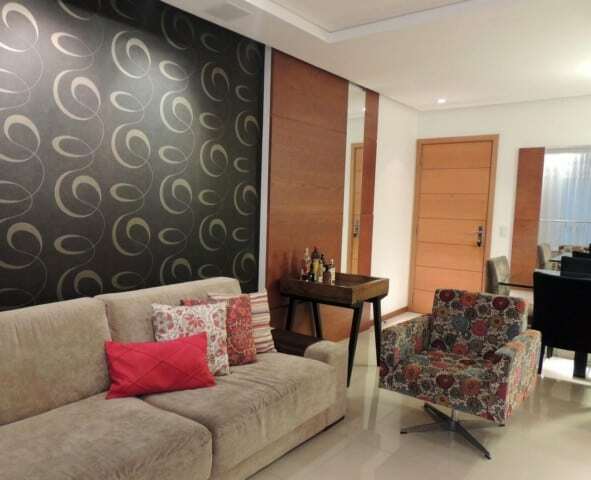 They allow to have a flexible interior and a configuration according to personal tastes and preferences. 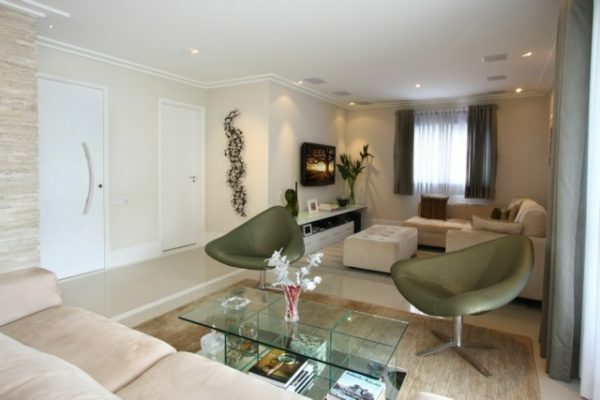 The living rooms decorated are very practical and versatile, since they allow to reorganize the decoration with ease. One can also deal with the contrast between the old and the modern. For example, some rustic or period touches may increase the aesthetic interest of the living rooms. Glass is a very used material decorated living rooms. Its transparency makes it very versatile and you can coordinate easily with minimalist living room decor. 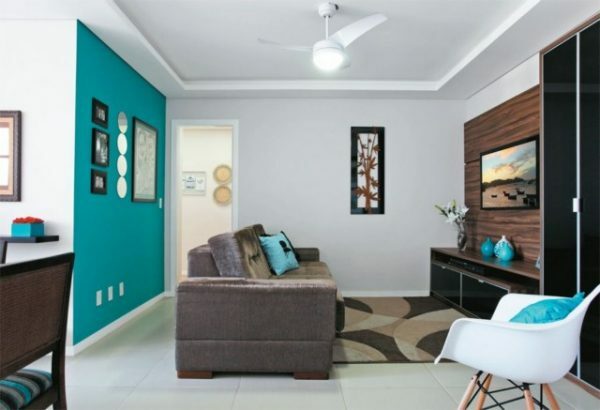 A glossy finish on furniture would help make the living room look stylish. 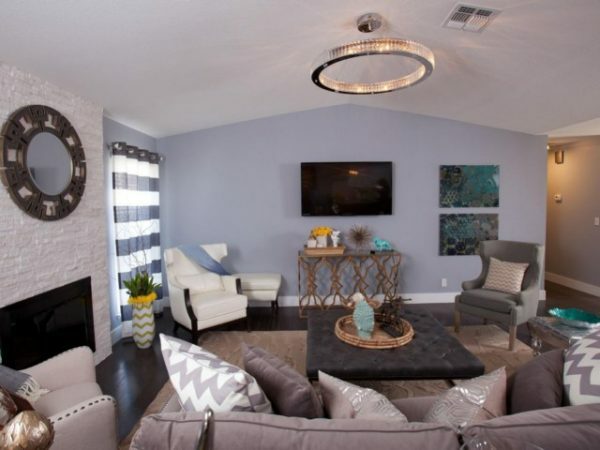 Since interior design should be simple and clean, many designers use contrasts to create focal points, for example, a modern space with industrial touches, or through color, for example, a living room where white predominates with a few touches of black color. Another element that characterizes the decoration of the living room are the large windows that let in lots of natural light and also allow beautiful outdoor views. We will show you some of the many ways to use white as the predominant color in a salon. Some projects have a touch of color, others are very perfectionists, others use a minimalist style of modern design and others are rather eclectic. A blank hall does not necessarily mean that you have to eliminate all the colors. 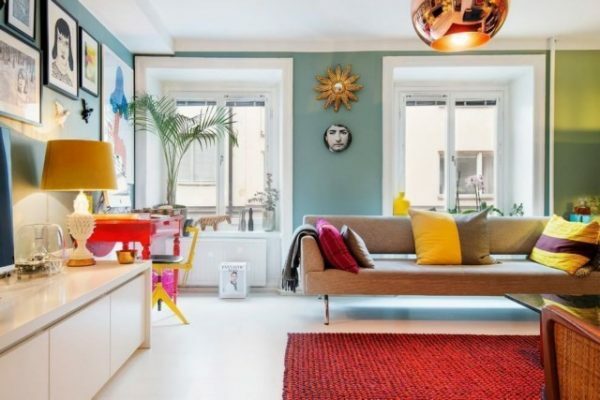 You can paint the wooden floors and white walls and buy a white sofa. You can compliment it with a chair or coffee table in bright colors. It is advisable not to choose a white carpet, since it is very difficult to maintain it. For a rug, it is best to use neutral colors or a colored rug. The white decorated living rooms also look beautiful if we combine them with neutral colors. 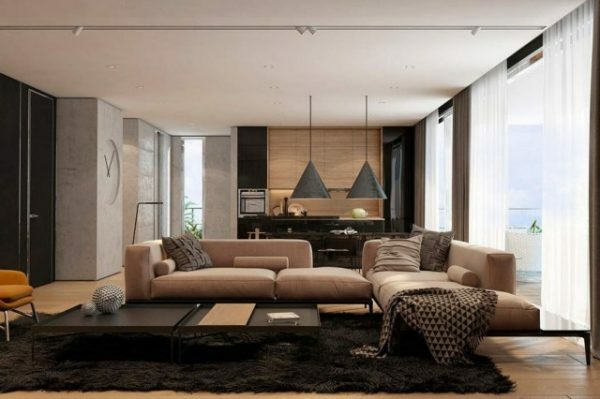 Many who enjoy the monochrome decor can take their living rooms decorated to achieve the purest modern style. 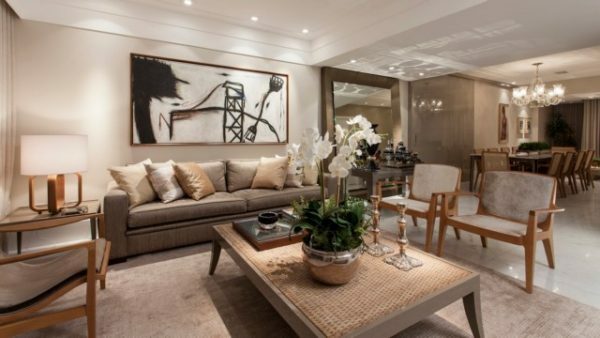 It is perfect for keeping a monochromatic living room and adding interest, for example, with a flower decoration on the wall. This other proposal is perfect to create a climate of calm and relaxation, where it is made a strong bet by the color of gray, and takes advantage of the red notes of the carpet and the lamp. 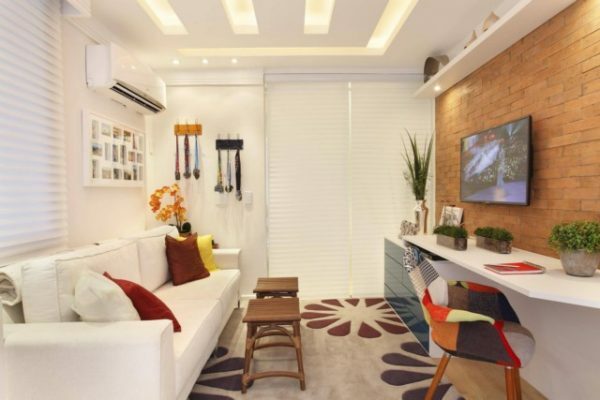 A small space can still be a statement of style if you have good taste in furniture and adds a lot of white and some pinch of color on decorating elements. A good way to achieve a contemporary living room is to bet on original furniture, vibrant color accessories and modern textures such as velvet. Using strong tonal colors only on furniture is a way to add color to a monochrome environment and add modernity to a living room. 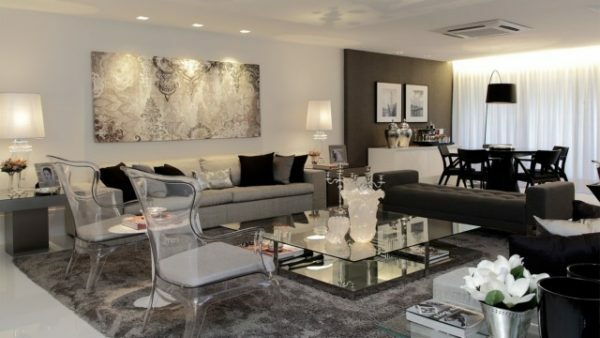 Supplements like contemporary art and leather furniture are perfect for creating a modern ambiance. Inspired by nature, using green accessories and organic shapes it is always fashionable. Using original furniture as well. The combination of white, red and black also ensures a modern environment. 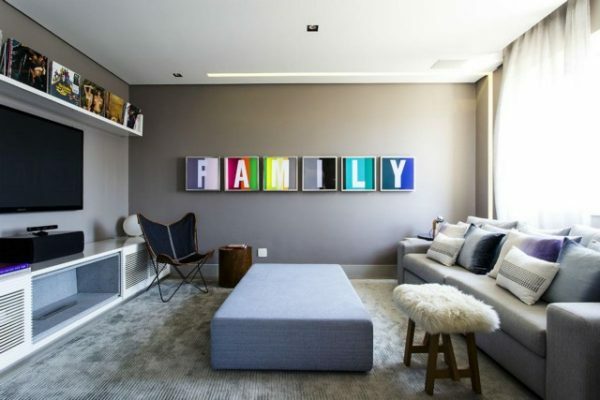 So you are also sophisticated, keep the walls white and add illustrations that help a modern setting. Color is a way of generating a modern environment. Combined bright furniture and a neutral rug not to over load the living room. Using black upholstery is synonymous with modernity. Combined with vibrant colors, original patterns and storage shelves, you will achieve a classic and very modern space. 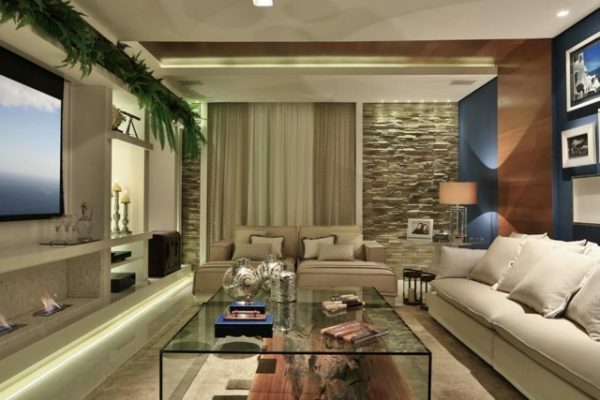 A well-lit living room is a perfect example of modernity. Very large windows, high ceilings and low furnishings are a summary of modern design. You can reach this elegant lounge by cladding the wooden walls and opting for dark furniture. Chocolate leather upholstery and dark brown wood walls create an elegant, refined and very sophisticated lounge. This luxurious penthouse combines the glamor of white marble and the expansive windows with modern, simple furnishings and a hairy rug. Cement and wood can blend in surprisingly, to recreate an elegant space and nothing cold, as is often thought. A modern living room does not have to have many elements. Only with leather sofas, plasma tv and maintain sophisticated living room with neutral colors, you will achieve a very modern space. Ethnic style is probably one of the most successful decorative models in recent years, boosted by its warmth, good taste and, above all, the exoticism it conveys, giving a clear image of delicacy mixed with a search for decorative tendencies the most natural. Now, few will have seen what happens from the conjunction of this modern style, so next we will see some rooms decorated in the ethnic and modern style. Basically what happened was that many people were not encouraged to make ethnic decorations, guys that were, preventing them from achieving the projects they had designed, either for their value or for their availability. That’s why the designers sought to convey the style, bypassing many decorative accessories that at first glance stolen from the original tomb fundamental to the decor, but time proved otherwise. They emphasized the typical colors and textures representative of East, Southeast Asia, and Africa, and any of these only added a representative decorative element. As you can see, the result is fantastic, as combinations of earth colors for African styles, as well as red with black and gray, for the oriental models, have created fantastic spaces, furniture rich in textures, but loaded with a clear modern accent. The lounge is a very special space, and it is very important to achieve maximum comfort. A modern fireplace provides warmth and comfort. It is characterized by its simplicity and contemporary appearance, and its glass panel offers a beautiful view of the fire. At night, by the fireplace, hall turns into a central place at home. They do not take up much space, and they allow you to save heating bills. 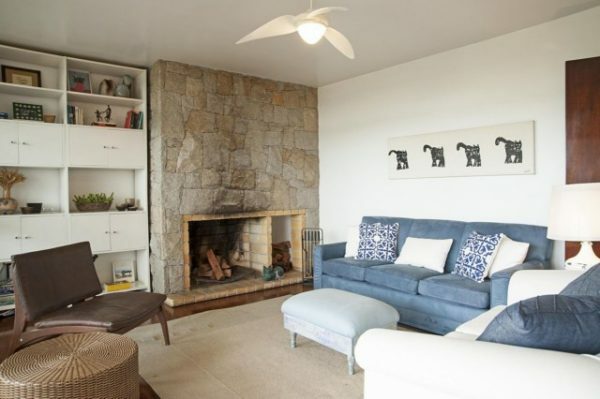 Even if you have a small room, you can have a fireplace to enjoy its pleasant warmth. A fireplace creates a special ambience and provides a better quality of life. Beside the chimney, you can add the furniture to sit and so read the favorite books or simply relax quietly. In small living rooms, it is advisable to use the white color or other luminous color as predominant, to visually enlarge the space. The small sofas are also an excellent solution for the decorated living rooms. You may also consider extending a window. This will give the feeling of breadth. In this type of living room, it is advisable to use sofas of shallow depth, and place it against the wall. To break the length a little, it is advisable to put two small sofas on both sides and a central table, accompanied by decorative objects. We all have the curiosity to know how the famous houses are, whether they have good taste or not, whether they are simple or not. 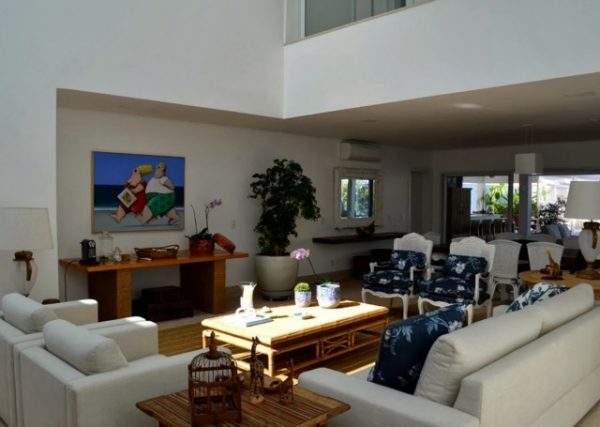 Here are the living rooms decorated with some of the most famous personalities of the moment, such as Reese Witherspoon (A Very Cool Blonde), Rachel Bilson (Jumper) and Brazilian model Gisele Bündchen, among others. In all the examples of decorated living rooms, you can see a normal environment where most of us would have no problem adapting. Rachel’s house has everything we can expect. Located in the hills of Los Angeles, the living rooms decorated, which combine the bohemian, with the elegance of a discreet style. Also in the State of California is the Witherspoon ranch. It has a beautiful architecture and an incredible atmosphere. You can even notice a Portuguese Renaissance touch, such as plaster walls and vaulted ceilings. 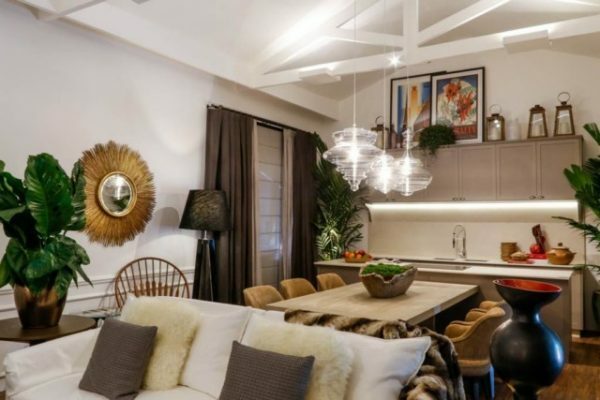 Always in the same area, we see living rooms decorated by Nate Berkus, with a healthy blend of old and new, very modern and fresh. While most Hollywood stars prefer to live in style, Vincent Kartheiser is one of the few exceptions. Your home has “only” 580 square feet; but it’s your decorated living room that takes all the looks. Fully furnished to give you a cool environment from the middle of the last century. Although the whole house of Gisele leaves us with the mouth open, but it is the decorated living rooms that surprise us. Comfortable seating, an outdoor fireplace and giant glass doors. Without doubt it is a space where we can be all day.